1 Here are a few of photos of my new diversion. I think I got a pretty good deal on this rig that needs some major work on the pony (starter) motor. It had been in a neighbor's barn when a storm hit a few years ago and collapsed the barn on it. No damage to the tractor but it then sat in the weather for a few years and the tracks got so rusted that many of the links were locked up. I did get them to bend a little with several days of WD-40 treatment and a 16 pound fence maul. 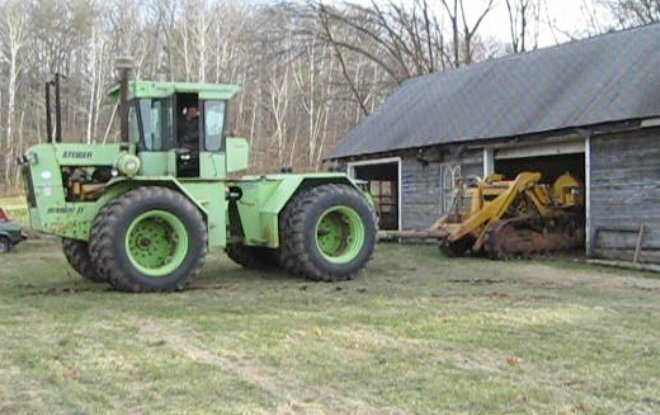 With the back blade on my John Deere 720 I cleared the building debris to make a path to it. I hooked a chain onto a track and with this mechanical advantage pulled it ahead about 20 ft. with my 720. Neighbor Jim Huber has a huge tractor that can pull like hell so we pulled it home. It has street pads on the tracks so we just pulled it on the pavement. With the loading bucket removed, the Cat will fit in my shop. Another winter project. 2 This picture was taken after I had pulled the Cat ahead. The oil slick on the ground is where the tractor sat. 3 Here is a view from the driver's seat while being pulled by Jim's tractor with John Huber driving the big rig. Five bottom rollers rolling over several stiff links made for a very rough ride. 4 Using a heavy fence post between the drawbar of the tractor and the bucket framework of the Cat we pushed it into the shop. The Cat is small enough to fit in the short space that barely accommodated the frame of the Diamond T truck. 5 The flywheel is about all that you can see of the pony motor that is below a cross member of the loader and behind the cross-over hydraulic manifold. It seems impossible to remove it. Suspecting that the diesel engine might be stuck I had attached a bar to the flywheel attempting to turn the diesel engine but the pony motor clutch just slipped. Oh oh! 6 With the pump lines removed, the hydraulic manifold is pulled up and back with the hoses still attached. There was enough clearance to get the pony out. 7 Looking down at the engine with the hydraulic oil tank removed my suspicion was confirmed. During work on the pony motor years ago the air cleaner and pipe to the intake manifold had been removed. 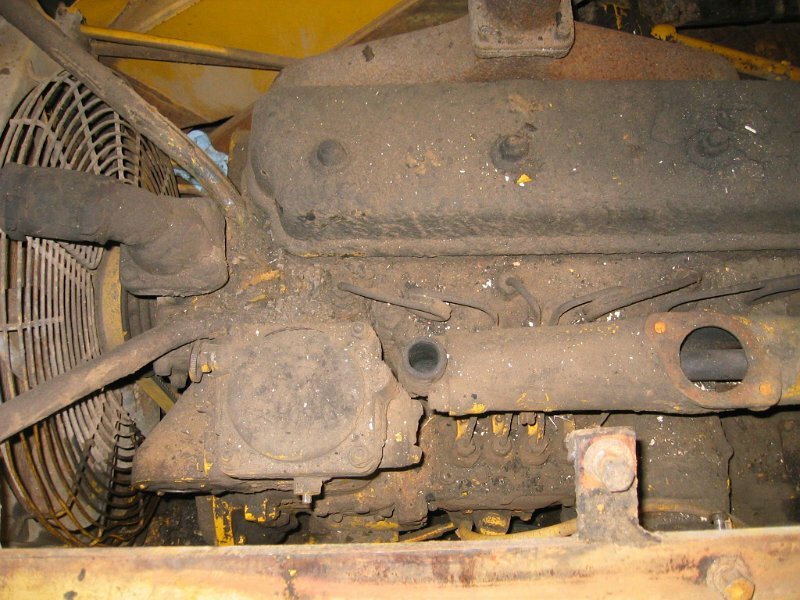 A cross member of the lift frame acted like a shed roof with the eaves right over the open intake manifold. I drained gallons of water out of the main engine oil pan. Notice the thick coating of grime. Everything around the engine was like this. 8 Not yet knowing how stuck the engine was I made a lever that I could clamp onto the hydraulic pump coupling. With this four foot long lever I could not budge it. 9 With the head removed and hovering over we can see why the engine was indeed stuck. 10 Number 2 and 3 pistons are stuck solid with serious rusting on the cylinder walls. I cleaned the rust with a 3M disk in a drill driver and for weeks soaked the cylinders with everything from Coke to vinegar to WD40. 11 With my engine hoist set on 2-tons, I lifted the bucket arms up to get them out of the way and to make it easier to crawl under the tractor. 12 I did not have a heavy rod for the frame eyes so I used a 4" x 4" x 1/4" steel tube across the frame to support the lift arms. A lot of confusion along with tons of time was spent looking trying to understand how the thing was put together. Only after cleaning away a lot of dirt and removing the steel belly guards could I figure out what part was tractor frame what was loader frame and how and where they were connected. 13 A view of the rig with some grime removed from the engine. Notice the foam padding that was added to the ends of the 4 x 4 tubing that is just head-high. 14 With the lift arms lifted out of the way I could clean some of the grime and remove an inspection cover from the engine to determine which piston was on the downstroke. Number 3 and 4 rods are visible with number 3 on the downstroke. 15 I turned a birch block the size of the cylinder and connected a cable come along to the 4' lever. I gently whacked the birch block on the top of both pistons with a 16 lb. fence maul. No luck at all. Now it seems that the only thing to do is to drop the pan and hope I can push the piston and sleeve up out of the block. 16 The engine and transmission it turns out, can be rotated up about the rear axle independently from the track and lift frames. The hydraulic pump drive shaft goes through the lower tank of the radiator making it necessary to remove the pump and radiator before the front of the engine can be lifted. This picture shows the radiator and pump being lifted out. 17 This picture shows more grime and how the lever was clamped to the pump shaft coupling. The next step will be to tip back the engine high enough so the oil pan can clear a track crossmember and be removed. 18 Following standard practice, in preparation for lifting the front of the engine, we jacked up the tractor and put about 10" of oak blocking under the sprockets. We also attached a chain between the track and track frame to discourage the tractor from moving ahead. 19 The plot thickens. With the head and pony motor already removed and having the engine lifted enough for the oil pan to clear the cross member it seemed not much more work to go head and remove the engine as seen here in the final stages. Heavy steel tubes laid across the lift arms served as hoisting points for a chain hoist and two cable lifts. With the rear of the tractor up on blocks the engine was nearly level. The tubes were moved along the lift arms, a few inches at a time, alternately blocking and lifting the engine. 20 The transmission was supported by an oak block with a heavy chain as an extra precaution while working under the tractor. A drain plug at the bottom of the clutch housing had been left out long ago allowing mice to set up housekeeping behind the clutch assembly. Why would they like such a dirty smelly place? The cat spent the winter outside under a tarp cover. In the spring we found that the mice had moved all the nest material into the battery box so we didn't have to clean this mess. 21 Now the engine rests on blocks in front of the Cat waiting to be moved to our neighbor John Huber's shop where it will be overhauled. John did expert work in overhauling our Model A and our Diamond T engines so this tradition is carrying on. 22 My son Scott is contemplating the feat after a change of clothes and a long shower. A lot of grime had transferred itself to him while he worked under the tractor. He provided invaluable assistance in the process of removing the engine. 23 On its way to John's shop, the engine stopped for a bath. After cleaning and drying the parting surface I had applied duct tape over the openings to prevent water and dirt from entering. 24 Not being an OSHA shop I sprayed the grime with gasoline out in the driveway. The weather was cold and damp so the gasoline did not evaporate before it did a good job of dissolving the grime. A pressure wash with hot water finished the job. 26 John takes over the disassembly and overhaul as it continues at his excellently equipped shop. Here the badly rusted pistons have been forced out of the sleeves. One of the sleeves had to be forced out of the block with the piston still stuck in it. 27 A closeup of a piston showing the rusted and frozen rings. After cleaning with a bead blaster it was discovered that all of the pistons were in really good shape. The pistons and the ring grooves showed very little, if any, wear, and no ill effects of the rust. 28 This is the oil pan undergoing a clean-up. It contained a moderate load of sludge considering that it had also held water for a few years. 29 This is the crankcase with the crank, flywheel housing and flywheel removed and all cleaned up inside. 30 Another view of the stripped down crankcase. 31 Here is a collection of parts removed from the engine. 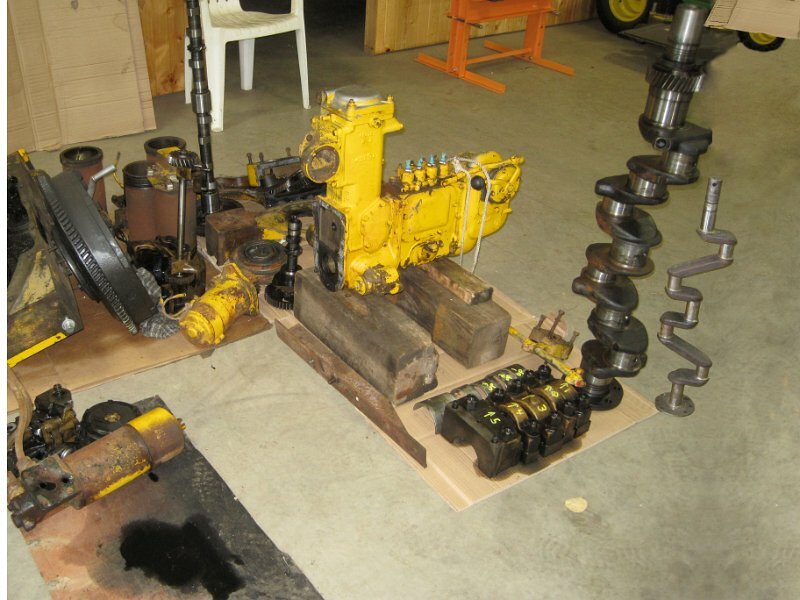 The injector pump, fuel filter housing, main bearings and bearing caps and the cylinder sleeves are on display along with several other engine items to be cleaned and serviced. 32 The cam shaft is also in very good condition showing very little if any wear or effects of the water in the engine. 33 The crankshaft stands on end. In spite of all the water in the engine the crank is in very good condition. No significant wear to the crank or bearings. Some surface discolorations only on a couple of the crank journals. I am very familiar with and used to seeing spindly Model T and Model A Ford crankshafts so this massive crank is quite a surprising hulk. 34 This picture shows the difference in crankshafts. It is a bit of a fraud because, for fun, the Model T crank has been added with Photoshop but the representation is quite true. 35 Here the engine is under reassembly with the crank, pistons and rods installed. 36 The fuel filter and transfer pump housing all cleaned up and reconditioned. 37 The governor housing and governor assembly also all cleaned up and reconditioned. 38 The pinion shift lever was worn from jiggling about so I bored the shaft opening in the flywheel housing for a bushing to make a good fit again. 39 This picture shows the contortions the milling machine had to go through to bore the pinion shift opening. 40 The flywheel housing and flywheel are now back in place on the rebuilt diesel engine. This picture was taken in John Huber's shop just after he finished the show quality restoration and complete overhaul of the engine. It will be a shame to install it in the old crawler. It would make a grand conversation piece at home in the living room. 41 John's front end loader-equipped Farmall has been a well appreciated, often overtaxed, but useful rig around the neighborhood. Here he is bringing the Cat engine back home. 42 This is the end of Part 1 of the D4 project. Click here to go on to Part 2.